Real handmade lace has always been a luxury item and was only available to a very wealthy social class. Lace equated to the art objects, it was highly valued and lace-making was extremely tedious process. 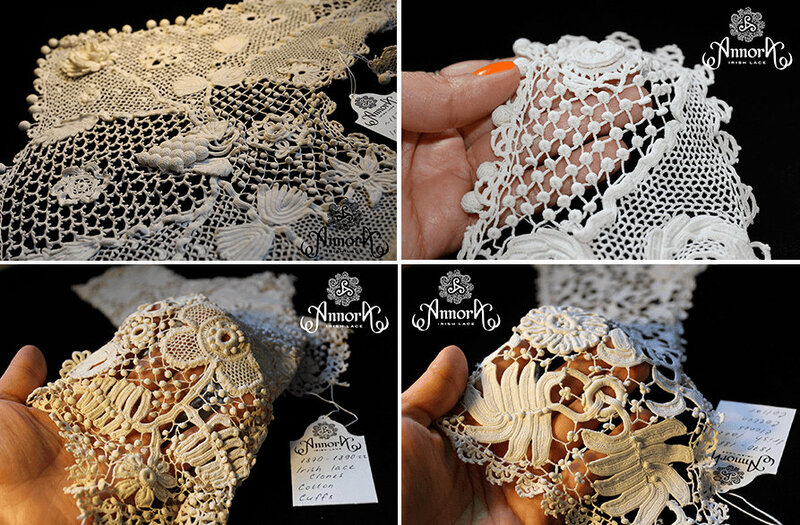 In the old days skilled lace makers created Lace using a needle (extremely expensive Venetian lace (Point de Venise), Brussels lace, French Alencon lace...), bobbins (lace of Bruges, Vologda, Elets, Vyatka, Kirishi...), shuttle (Tatting or French lace, Malin, Chantilly, Brabant, Valenciennes...) and, finally, with the help of very fine crochet hook and needle (Irish Crochet lace). 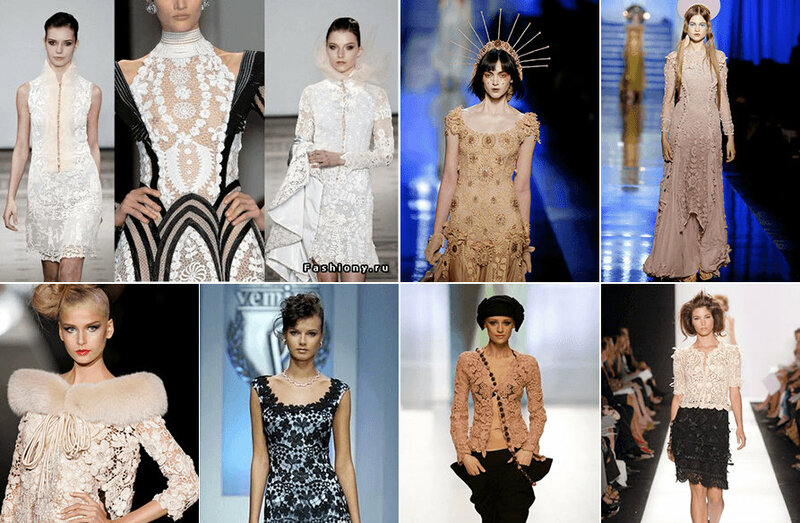 In this age of rapidly developing high technology and automated production, cheap machine lace turned Lace from an art object and luxury to the usual mechanized clothing decoration. You can mechanically create needle, bobbin or shuttle lace in 21 century. It is impossible to imitate Irish Crochet Lace with any of the most modern equipment: it combines textured lace made with thin crochet hook and the further painstaking assembling of individual motifs with a needle on a mannequin to create final product, achieving perfect seamless fit. Only the hand of the artisan can create this Lace. ICL technology was invented in Ireland during the time of the Great Famine of 1845-1851, when due to the potato crop loss people were at the edge of survival. The daughter of French and Spanish nobleman and Irish woman, Riego de Blancardies, invented a method of using a very thin hook to get excellent variation of fashionable and extremely expensive Venetian lace, which was created using a needle. A fragment of lace, which required 200 lace-maker's working hours using a needle, can be finished in just 20 hours using crochet hook. The latter also gives lace more texture and makes it more interesting than Venetian lace, keeping fine and elegant lines of the prototype. 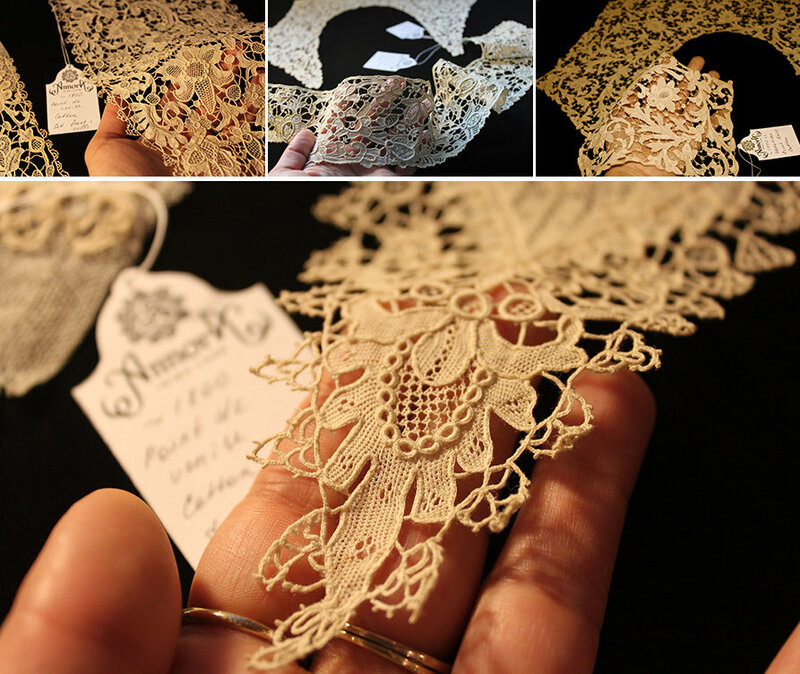 Venetian lace-Point de Venise/Samples from Annora private collection of antiques. 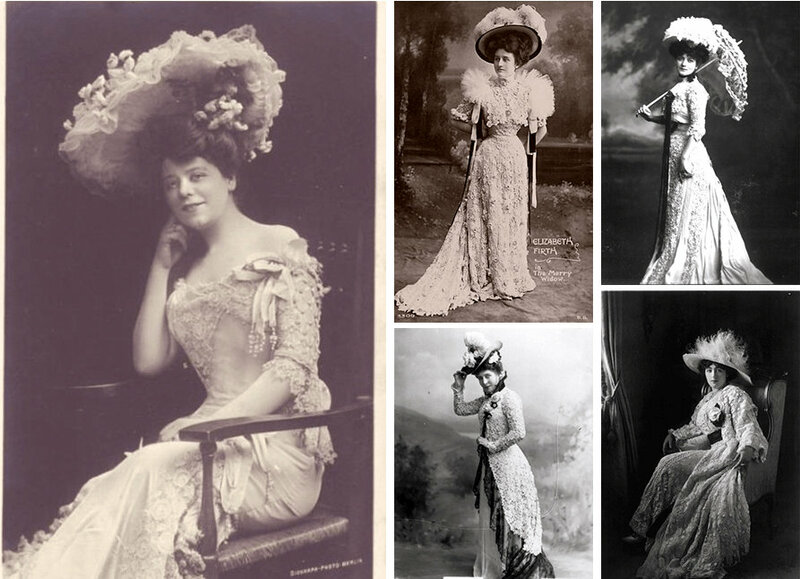 Vintage photos of wealthy women in clothes made completely out of ICL or with ICL finish. Lace-workers who assembled the piece also specialized in creating different "chain stitches" (connections) between motifs: they used thin crochet hook or needle in their work. The old ICL used more than 20 types of assembling lace cloths, and every city of Ireland preferred its own connections. The most recognizable for ICL are the characteristic Clones ties (from the name of the city, where artisans invented the technique of creating such a tie, rotating crochet hook multiple times around its axis around the working yarn). Clones connections. Different kinds of "chain stitches" in the ICL. Samples from Annora private collection of antiques. People in Dublin, London, Paris, Rome, New York and San Francisco were buying ICL gladly. In 1900, ICL came to France and started to compete with the most beautiful handmade needle lace. World War II consequences and cheap machine lace production seemed to finally kill the subtle art of Lace-making, leaving the real manual "glowing" Lace in old clothes museums as part of expensive suits of wealthy people of that time. 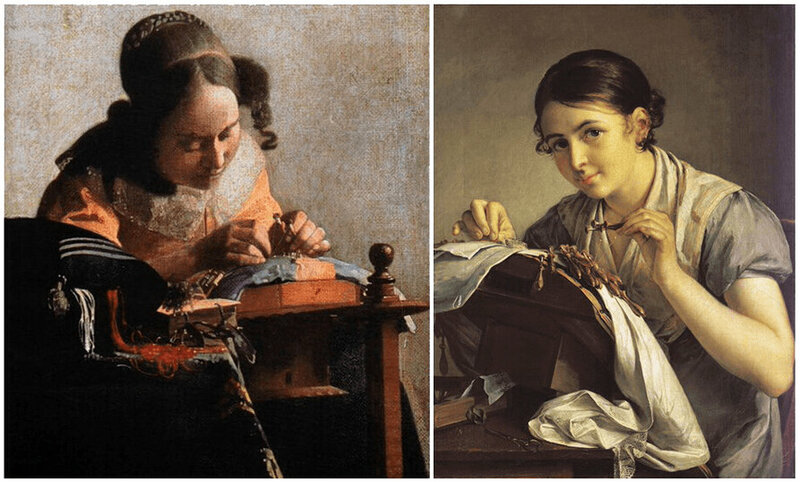 But even the most brilliant machine imitation cannot compare with the real "live" work emerging from the hands of the lace-maker, as stamped reproduction of the painting cannot compete with the original. Handmade lace carries incredible energy, like any work of art created by hands, with the artisan putting so much love and effort into it. Many Royal families members use vintage Irish Crochet lace as elements of their cloth(wedding dress trim or veil) during formal ceremonies. 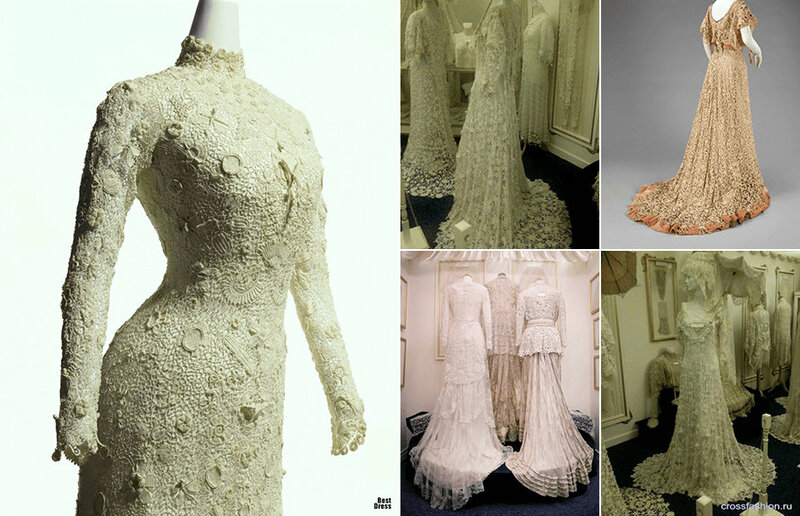 And the existing samples of vintage lace dresses are of huge museum interest as an example of excellence in handmade execution. The Metropolitan Museum of Art, New York, United States. Kyoto National Museum (Kyoto, Japan). Sheelin Antique Irish Lace Museum, Northern Ireland. Today on the catwalks around the world models wear cloth made either entirely of ICL or with ICL finish. Color is one of the innovations modern designers bring! Old antique ICL of late 19th - beginning of 20th century was almost always white, due to tradition of "white tea dresses". Antique ICL dress at the shoot. Coco Before Chanel, 2009, Arsene Lupin, 2004. Today you can see gorgeous black color and a lot of different shades and tones of any color on the catwalks. Because of the subtle process of its creation, ICL is found mainly in Haute Couture collections of such fashion designers as: Chanel, Kenzo, Oscar de la Renta, Jean Paul Gaultier, Alexander McQueen, Maurizio Galante, Yukiko Hanai, Elie Tahari.. All these things are produced in a single copy and are extremely rare. Irish Crochet Lace in contemporary Haute Couture collections. Having studied antique lace samples, we recreated the manual production technology and created a unique clothing collection made of real Irish Crochet Lace for you!